The University of Birmingham used eye tracking to examine how different operators perform road traffic control tasks and make decisions based on noisy data streams from various sensing technologies and historical data. Data moves fast in a road traffic control room. How do the operators that keep our streets and highways flowing smoothly process complex information coming from multiple sources simultaneously? Researchers at the University of Birmingham used wearable eye trackers from Tobii Pro to assess the decision-making strategies of traffic control operators as they managed an 'object in the road' task. The results clearly illustrate the value of eye tracking in human factors assessments. Eye tracking allowed the researchers to directly measure and analyze visual information sampling behavior in the field study. 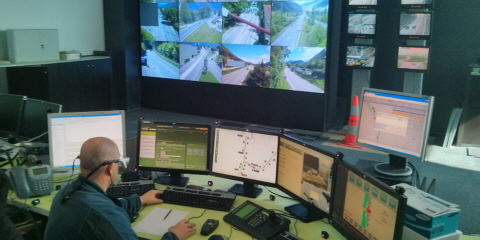 This information is crucial in a road traffic control room because the situational awareness of operators can be deceptive and based on familiarity effects. Eye tracking offers a means of studying and adapting user interfaces to better support more accurate and efficient operator performance. The study illustrated how human actions within complex environments can be understood using eye tracking metrics based on social network analysis. 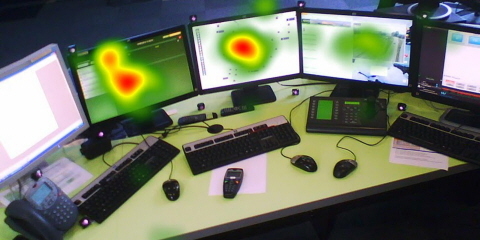 When researchers collected all of the gaze data from an operator, they were able to see where the operator focused most of their attention and how it shifted, as shown in the heat map above. It was clear that, in routine tasks, the operator viewed the incident report screen and the map of the road network (as shown by the red centers of the heat maps) and gave less attention to the CCTV feed (and the joystick to control the camera for this feed). A heat map showing where operators focus their attention. The objectives of the study were to find out how different operators navigate multiple information sources, to analyze the ways operators use information sources, and to see operators' strategies when responding to incidents while completing their tasks. Additionally, the study was designed to determine the correlation (dependence) between head movements, gaze shifts, and their relationship to task structure. By analyzing patterns of attention, the researchers gained insight into how operators deal with the available information and the relative importance of the different information sources. The data will be used to develop models of the operators' decision-making process in order to evaluate the screen designs developed under the SPEEDD project. In this study, researchers used wearable eye trackers from Tobii Pro to study how three operators resolved a simulated 'object in the road' task, requiring information gathering and integration from multiple displays. Control room operators rely on visual information processing facilitated through visual sampling, which was quantified using Tobii Glasses 1. The primary goal of this study was to forecast traffic congestions and make decisions in order to decrease them. Operators predicted traffic congestions 5-20 minutes before the actual occurrence and they made decisions regarding traffic light settings and speed limits within 30 seconds. This was done by enabling the integration of a multi-technology sensor network for real-time traffic data collection. Control room tasks, such as road traffic management, require continuous visual assessments paired with active interventions. This includes monitoring a range of information sources and real-time resolution of live scenarios using standard operating procedures. The operators wore Tobii Glasses 1 to record exactly where they looked during the study. Gaze data was mapped on ten areas of interest , and head orientation was automatically inferred from the video data. Subsequent analysis was performed using Matlab (MathWorks). Located in front of the operator in the control room (see Figure 1) are five computer monitors displaying incident logs, a schematic map of the traffic network, a live CCTV feed linked to the camera that the operator is currently controlling, and access to the internet. In the background there is a large display panel with a 4x4 color array of CCTV feeds from different traffic cameras, as well as a smaller display panel with color CCTV feeds that can be interacted with from the desk. Also located on the desk are standard computer peripherals and phones/radios for communication with stakeholders outside the facility. and processes the information differently. Thus, it is important that the control room environment and procedures support multiple visual strategies. the contribution of head movements to gaze shifts is highly subject specific. the relative importance of the different information sources and the ways operators deal with them. The eye tracking results will help develop models of decision making in control rooms. In addition, the researchers will use the data in designing new road traffic control interfaces and operating procedures for future use.